Southern Melbourne. 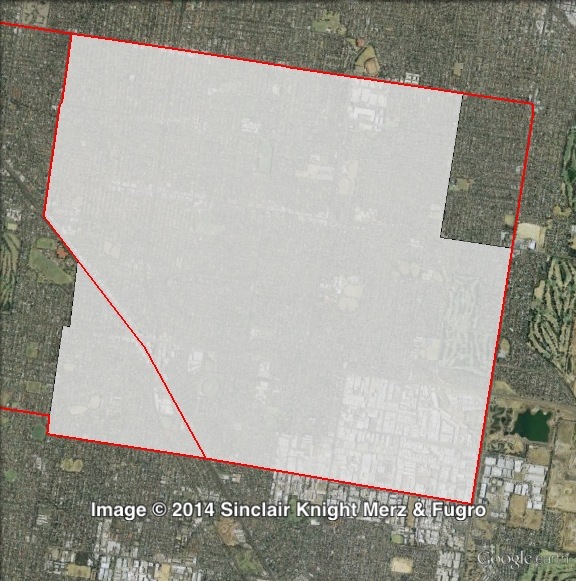 Bentleigh covers the suburbs of Bentleigh, Bentleigh East, Brighton East, McKibbin and Moorabbin. Most of the electorate is contained in southern parts of the City of Glen Eira, as well as small parts of the Bayside and Kingston council areas. 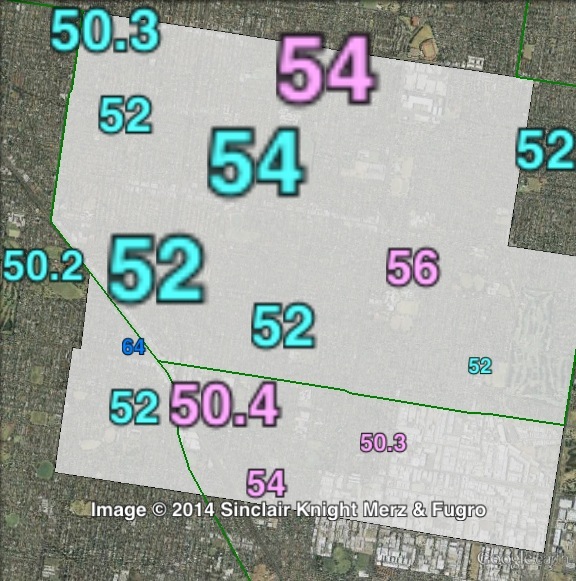 Map of Bentleigh’s 2010 and 2014 boundaries. 2010 boundaries marked as red lines, 2014 boundaries marked as white area. Click to enlarge. Bentleigh lost a small areas in the north-eastern corner of the electorate to Clarinda, and gained parts of Moorabbin and Brighton East in the south-western corner of the electorate from Brighton. These changes increased the Liberal margin from 0.6% to 0.9%. Bentleigh was first created prior to the 1967 election. 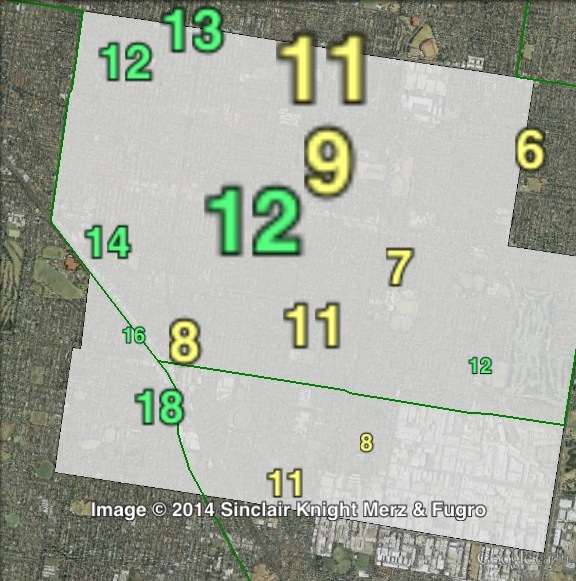 In thirteen elections, Bentleigh has been won by the party that formed government eleven times. Bentleigh was first won in 1967 by the Liberal Party’s Bob Suggett, who had previously held the seat of Moorabbin since 1955. He held the seat until his defeat in 1979 by the ALP’s Gordon Hockley. Hockley was re-elected in 1982 and 1985, and retired in 1988, when he was succeeded by the ALP’s Ann Barker. Barker held the seat for only one term, losing Bentleigh in 1992 to the Liberal Party’s Inga Peulich. Peulich held Bentleigh for three terms, losing her seat in 2002. She later won a Legislative Council seat in the South Eastern Metropolitan region in 2006. Bentleigh was won in 2002 by the ALP’s Rob Hudson, who had previously been an advisor to Deputy Prime Minister Brian Howe and Premier Steve Bracks. Hudson was re-elected in 2006, and lost his seat in 2010 to Liberal candidate Elizabeth Miller. Bentleigh is a very marginal electorate. The Liberal Party should benefit from a new personal vote for Elizabeth Miller, but if there is a significant swing to the Labor Party she will find it hard to hold on. 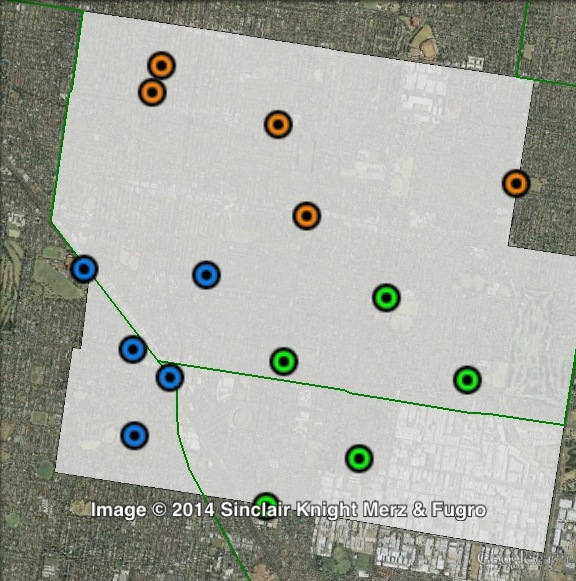 Polling places in Bentleigh at the 2010 Victorian state election. North in orange, South-East in green, South-West in blue. Click to enlarge. Booths in Bentleigh have been divided into three parts: North, South-East and South-West. The Liberal Party won slim majorities in the north (50.6%) and the south-west (51.5%), while Labor won a 51.8% majority in the south-east. The Greens came third, with a vote ranging from 9.4% in the south-east to 12.5% in the south-west. Two-party-preferred votes in Bentleigh at the 2010 Victorian state election. Greens primary votes in Bentleigh at the 2010 Victorian state election. Put $30 bucks down on the Libs to hold this seat. Live in the electorate and I’m not seeing the momentum to the ALP that eveyone talks about, a month out you can tell by the local vibe if there’s a swing on. This time nothing. Elizabeth Millar has been a very effective local member, she may prove very hard to dislodge. Rob Hudson was once in line to be MP for Northcote but then left lost the local numbers & he was exiled to the sandbelt. I agree with Sandbelter, Elizabeth Miller has worked extremely hard on the ground in Bentleigh. She can hold this seat with sophomore surge. It is actually a “double” sophomore surge. Labor has lost Hudson’s personal vote, & the Libs have Miller’s personal vote. + Add Sandbelters demographic change, & it looks like Stalkos needs to make up at least 5.5% he’ll already lose. Yes, the swing was above average in 2010 but Labor actually had a swing to them in 2006 (as a result of Hudson’s sophomore surge. Yes. i understand what you are saying. I am sort of going on what, & how Peter Brent formulates. i forgotten his criteria. Observer, I think the election is more 50/50. The 2PP opinion polls were in exactly in the same spot in 2010. Sandbelter, sure Labor fell apart late in the 2010 campaign, but in 2006 the polls barely moved all year. If we are talking odds the most likely outcome would have to be a Labor victory. A late swing is just as likely to favour Labor as it is the Coalition. The last Newspoll has Labor leading 55-45 on 2PP. I believe the most recent Essential had Labor leading 52-48 on 2PP. The Coalition won 51.6% in 2010. Everyone expects the polls to tighten. Do you think this is an early sign, or too soon??. Why? I have no idea if the polls will tighten, all I have to go on is Labor winning every poll now for a substantial length of time. You are probably right. However the govt’s you mention were very old… This one is not. Newspoll has a 5% 2PP swing to Labor since 2010. First term Lib members will have had to have been working hard if they are to hold on against the trend. Unless something changes and soon, this will be a Labor gain. Polling for this seat coming tomorrow to a Herald-Sun near you. Have reason to believe it’s a Galaxy taken Thursday night. If so the first non-party/union seat poll of the whole campaign. Par for the course here for Labor is 52:48, if they’re not ahead at all then that gives some credence to either the state position tightening or the seat being harder than it looks. 2PP reported as 52:48 to Liberal from Herald Sun Galaxy. This isn’t a surprise and as ma local it’s exactly what I’m seeing on the ground. Bentleigh was always going to be hard for the ALP. Nick Staikos is not connecting with voters and I’ve seen voters walking on the other side of the road to avoid the ALP and then go up to Elizabeth Miller and giver her a piece of their mind. That says to me that Bentleigh hasn’t given up on the Liberals…yet. Second Elizabeth is an effective member of parliament, she’s in everything and has a very strong local backing….the same can be said for Lorriane Wereford in Mordialloc and Donna Bauer in Carrum. These ladies will be hard to move. Which brings us to the elephant in the room. If Green polling is correct (and given the sample sizes it’s hard to argue against them until we see the actual poll) it means we are looking at next government being decided in Brunswick, Melbourne and Richmond where the falling Liberal vote can only help the Greens. I think Greens are realistic in two of the three as suggested by the Lonegran poll. I’m betting on Greens in Richmond and Melbourne. Whilst, I’m betting for ALP win in Victoria, if the Libs hold two of Bentleigh, Carrum or Mordialloc (which is looking increasingly likely) then a 44 ALP, 42 Lib, 2 Green looks more and more the outcome here and Victoria has a ALP Green coalition (I’m giving the ALP one of Carrum or Mordialloc here, but let’s throw Morwell in the mix as well and call it Mordcarwell). IMO ALP gains: Monbulk, Bellarine, Yan Yean, Wendouree, Frankston, Mordcarwell. IMO, this poll in Bentleigh could force the ALP to make a tough call this week. Namely does it re-divert resources into inner city to make the election a 46/42 result or ignore Lonegran and risk 44/42/2. It could have a big bearing on the 2016 federal election (which up to now I had thought was in the ALP’s bag). Sandbelter I think it’s more of a reflection that the sophomore surge is in Victoria. I Agree with you I think this is going to be a hard seat for the ALP but I’d still say this is line balk when the margin of error is considered. I think it’s tougher for the libs who now have to accept the truth that Ballarat and regional seats labor holds are not going to swing to the Libs with the exception of Ripon and possibly Macedon. It was noted on another post that the poll the greens commissioned assumed that undecided voters would flow to the greens and preference flows are going to make it hard to tell. I still believe that the Melbourne By-Election was there best chance and they blew it, without the ALP doing and nationally and state wide there is very little for them to hope for but I could be wrong. I look to WA where the most marginal ALP seat held but the rest fell so I wouldn’t go as far to say that the other seats u mentioned are increasingly likely to stay. I would say that there is a huge undecided vote in the seats which could bring it one way or another. But I honestly question the accuracy of the polling given that Bellarine had the ALP only at 54 despite Andrews and Napthine being tied for preferred premier which hasn’t been a feature in state wide polling which shows andrews behind despite leading 56 on 2PP. Publicly released Green polling usually isn’t reliable though the second federal Melbourne Galaxy in 2013 was rather good. Labor has given them oxygen in recent days and I do give them a serious chance of getting Melbourne at least – it’s just difficult to quantify it. Observer: The statewide 56s that have showed Andrews trailing as pref prem were actually 53s or 54s by last-election preferences. And in the last Ipsos he wasn’t trailing by much and Napthine’s edge on pref prem for a given set of voting intentions seems to be closing. All square on pref prem for 54:46 to an opposition well into a campaign is about what I’d expect (and pref prem is a rather noisy indicator anyway). So I don’t have any problem with the pref prem figures in either of the Galaxy seat polls. I presume you’re talking about Albany? That’s a regional seat with a very popular Labor MP who won the seat last time Labor won govt… compare to Ripon, not so much suburban Melbourne. WA 2013 isn’t really comparable, though. Both involve first-term Lib govts up for re-election, but WA Labor got splattered (to the point of losing seats they’d held for 50 years). Vic Labor has a good chance of winning. WA 2013 compares well to Vic 2002, NSW 1999, SA 2006 or Qld 2001, if you flip the parties. As for Vic 2014? There aren’t too many elections where one-term governments lose… the last two were Qld 1998 and Tas 1996 (obviously skewed by One Nation and the Greens respectively). I don’t think there’s any others in the last few decades.